You are right here if you are looking for the popular Hansgrohe Raindance shower programme. Hansgrohe Raindance hand showers, Hansgrohe Raindance shower panels and Hansgrohe Raindance shower sets are equipped with the most advanced technology, such as the AirPower technology which enriches the shower water with air. The result: a beautiful, voluminous feeling on the skin and reduced water consumption. Enjoy additionally the massage function of the Hansgrohe Raindance showers with multiple jet types. Whether you are looking for a Hansgrohe Raindance Showerpipe, or a combination of freely selected Hansgrohe Raindance head shower and Hansgrohe Raindance hand shower, here you will find what your heart desires. Regardless whether 36 or minus 10 degrees outside temperature, all you need is a shower! And the best is if it is a shower that you assemble by yourself in combining a Hansgrohe Raindance hand shower with a Hansgrohe Raindance head shower. It can be optimized with a special soap dish and relaxing body sprays. Or how about a Hansgrohe Raindance showerpipe, it combines everything you need for a refreshing and relaxing shower, and reduces your water and energy costs without any loss of comfort by means of its EcoSmart technology. But what are your real wishes in the shower and how can they be realized with the help of Hansgrohe Raindance? Well known and most common is probably the hand shower, regardless whether it is the Hansgrohe Raindance hand shower or any other product, regardless whether it is a shower or bathtub, everyone has a hand shower in his bathroom. And there are good reasons for it, it is simply practical, it doesn’t matter whether you just quickly want to wash off something, to wash your hair or just rinse off something, the Hansgrohe Raindance hand shower offers everthing and provides the corresponding mobility by means of the right shower hose. Once you have decided for a Hansgrohe Raindance hand shower, you can convince yourself. A hand shower alone is often not enough; you need at least the right shower holder or even a shower rail to complete your Hansgrohe Raindance hand shower ideally. Nowadays, you can find the shower head in more and more bathrooms. 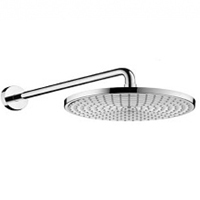 Whether a round or a squared head shower, fixed directly at the ceiling or at the wall, we offer all these versions. A Hansgrohe Raindance shower head does no longer belong to the category of luxury items, it simply belongs into the bathroom increasing the comfort factor in the shower. No wonder that more and more people directly opt for the Hansgrohe Raindance showerpipe in case of renovating their bathroom. A Showerpipe combines hand and head shower. Meanwhile you can acquire a Hansgrohe Raindance showerpipe for small money in combination with the matching thermostatic mixer, luxury doesn’t need to be expensive. In case the Hansgrohe Raindance hand shower, Hansgrohe Raindance head shower or even the Hansgrohe Raindance showerpipe is not enough luxury, we can recommend a Hansgrohe Raindance shower panel with a good conscience. This panel combines a thermostatic mixer with an overhead shower and a hand shower in the most elegant way and is certainly an excellent eye catcher in your bathroom. To put it briefly, it does not matter whether it's hot or cold outside, with Hansgrohe Raindance you are always well positioned. The best thing is that you will always find the perfect Hansgrohe Raindance shower among all the Hansgrohe Raindance products.